According to a press conference release from Yamaha Motor Corp. 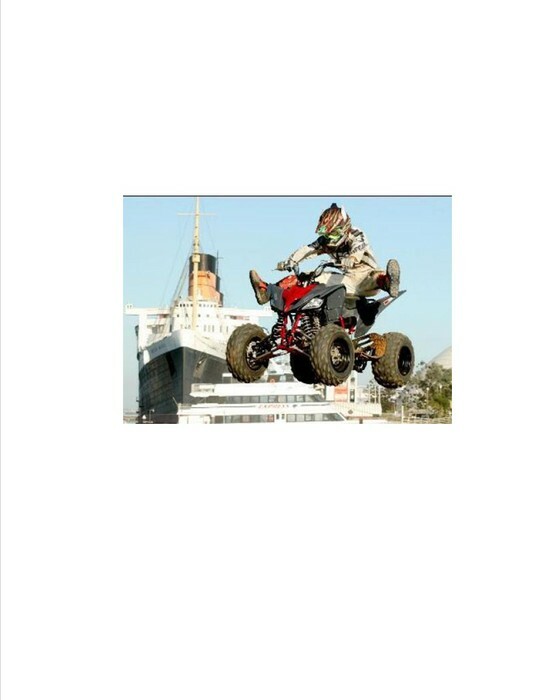 There are many different engine sizes for ATV’s. Another way to get a certain engine size is to buy a different make. The Yamaha grizzly 300 has a 287cc engine. (1) as Yamaha designers say “The new 2012 Grizzly 700 and 550 receive new textured plastic body panels that increase durability and decrease wear over the life of the machines” (Yamaha Motor Corp.2) to decrease engine heat and make the larger engines last longer. The engine size in ATV’s matter because depending on what type it is because if you have a 4X4 you need a large engine so that your engine doesn’t stall when in Four Wheel drive. The Grizzly's engines feature a forged piston for reduced weight and added durability (Yamaha corp.6). 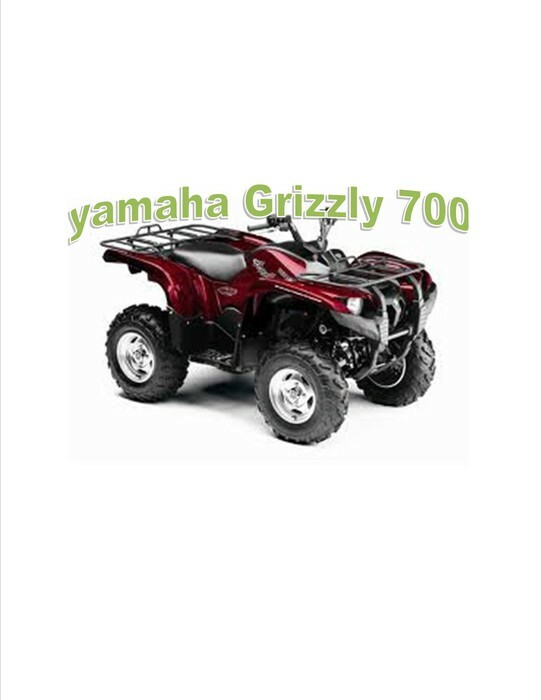 According to a conference release from Yamaha Motor Corp. the Yamaha Grizzly 300 can pull up to seven hundred and twenty pounds. And carry up to one hundred and forty pounds on its front and rear racks (Yamaha Motor Corp. 1). To help with the weight capacity the Yamaha corp. has made “More than five inches of clearance allows it to cover rough ground, and its double wishbone front suspension system with 5.9 in. of travel and a rear swing arm with 6.5 in. of travel allow for terrain navigation”(Yamaha motor corp.2). This helps with the distribution of the weight being transferred so the ATV can bear more weight. The Yamaha grizzly 700 has the capacity to carry “99 pounds and 187 pounds of carrying capacity on the front and rear racks, respectively, and the 1,322 pounds of towing (Yamaha corp.10). According to a press conference “YAMAHA launched the Grizzly 300 2-wd utility ATV priced at $4,099” (1). At almost twice the price of the Yamaha grizzly 300 is The Grizzly 700 (MSRP $9,749) is Yamaha's flagship ATV with top-of-the-line features like Electric Power Steering (EPS), fuel injection, Ultramatic® automatic transmission, On-Command® push-button four-wheel-drive, four wheel independent suspension and much more, making it the toughest, most off-road capable ATV in its class (Yamaha Motor Corp. 1). 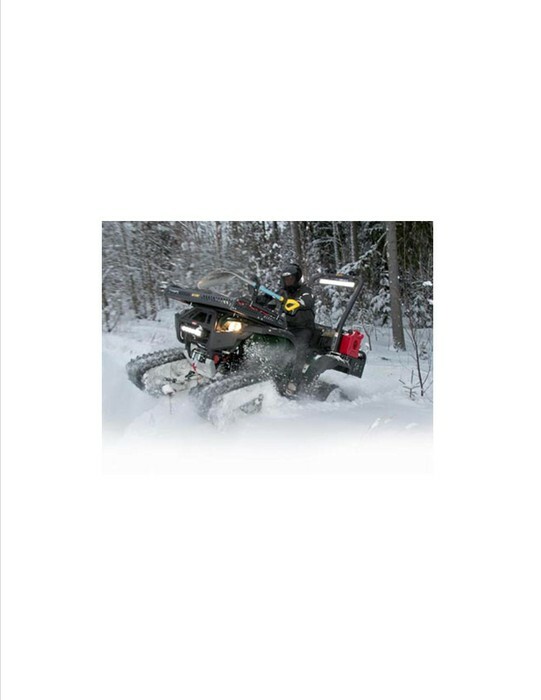 The major variance on the price of the Yamaha grizzly ATV’s is the size of the motor and the cost to build it. Another variance is the amount of parts used on the frame and body. The plastic to make these parts is very expensive to buy and make. 1 "ATV." ATV. Yamaha, 2011. Web. 30 Oct. 2012. <http://www.atv.info/>. 2. "Yamaha - Motorcycles, Outboards, ATVs, Snowmobiles, Boats, Scooters, Wave Runners, Motorcycle, and Generators - America's Most Diverse." Yamaha - Motorcycles, Outboards, ATVs, Snowmobiles, Boats, Scooters, Wave Runners, Motorcycle, and Generators - America's Most Diverse. Yamaha Motor Corp., 2012. Web. 30 Oct. 2012. 3. "Quad Riders Club of Victoria." Quad Riders Club of Victoria. N.p., 2012. Web. 30 Oct. 2012. <http://www.qrcv.com.au/>. 4. “Yamaha Grizzly 700 and 550 atv’s now assembled in the usa.” Yamaha Motor Corp. June 8th 2011. Press release. 5. 2012 YAMAHA Grizzly 300 Automatic. 2012. Photograph. Top Speed. Yamaha, 2012. Web. 31 Oct. 2012. 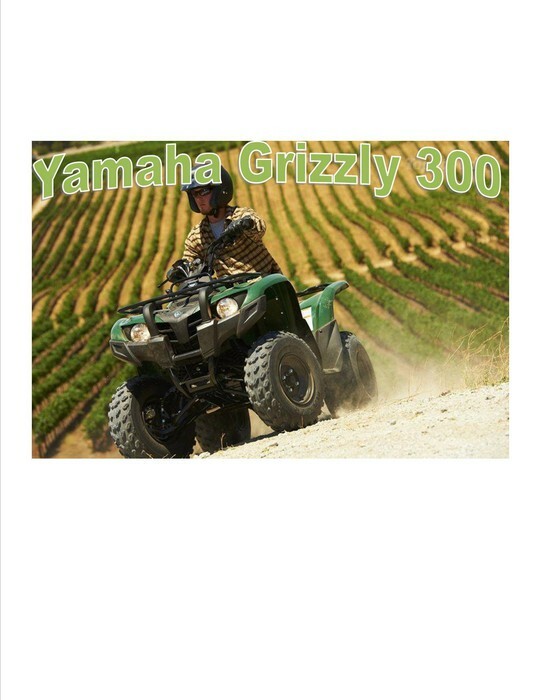 <http://www.topspeed.com/motorcycles/motorcycle-reviews/yamaha/2012-yamaha-grizzly-300-automatic-ar118803/picture422042.html>. 6. N.d. Photograph. 2009 Yamaha Raider Pictures & Specs. Yamaha, 2012. Web. 31 Oct. 2012. <http://www.yamaha-motorcycles.org/page/29/>. 7. N.d. Photograph. 2013 Yamaha Grizzly 550 FI Auto 4x4. Yamaha, 2012. Web. 31 Oct. 2012. <http://www.totalmotorcycle.com/ATV-Quad/2013ATVmodels/2013-Yamaha-Grizzly550FIAuto4x4.htm>. 8. N.d. Photograph. 2009 Yamaha Grizzly 550 EPS/ PERFECT CONDITION!!! Yamaha, 2012. Web. 31 Oct. 2012. <http://forum.highlifter.com/2009-Yamaha-Grizzly-550-EPS-PERFECT-CONDITION-m4101839.aspx>. 9. N.d. Photograph. Need Pics of Big Bad Outty's!!!! Yamaha, 2012. Web. 31 Oct. 2012. <http://forum.highlifter.com/Need-pics-of-Big-Bad-Outty39s-m2847365-p2-print.aspx>. 10. N.d. Photograph. Need Pics of Big Bad Outty's!!!! Yamaha, Can Am ,arctic Cat, 2012. Web. 31 Oct. 2012. <http://forum.highlifter.com/Need-pics-of-Big-Bad-Outty39s-m2847365-print.aspx>. 11. N.d. Photograph. 2009 Yamaha Grizzly 550 EPS/ PERFECT CONDITION!! !Yamaha, 2012. Web. 31 Oct. 2012. <http://forum.highlifter.com/2009-Yamaha-Grizzly-550-EPS-PERFECT-CONDITION-m4101839.aspx>. 13. .N.d. Photograph. May 2009 Yamaha ATV Tuner of the Month. Yamaha, 2012. Web. 1 Nov. 2012. 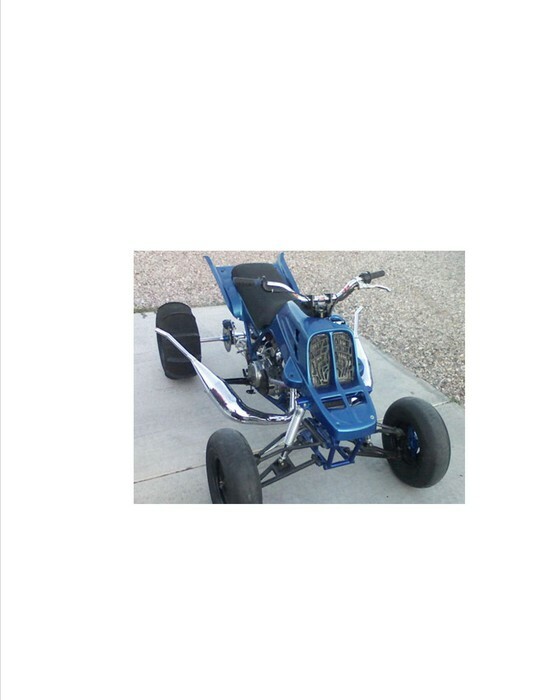 <http://www.bluetraxx.com/forums/bluetraxx-com-ride-month/73420-may-2009-yamaha-atv-tuner-month.html>. 14. N.d. Photograph. A Fearsome Finnish Yamaha Grizzly. Yamaha, 2012. Web. 1 Nov. 2012. 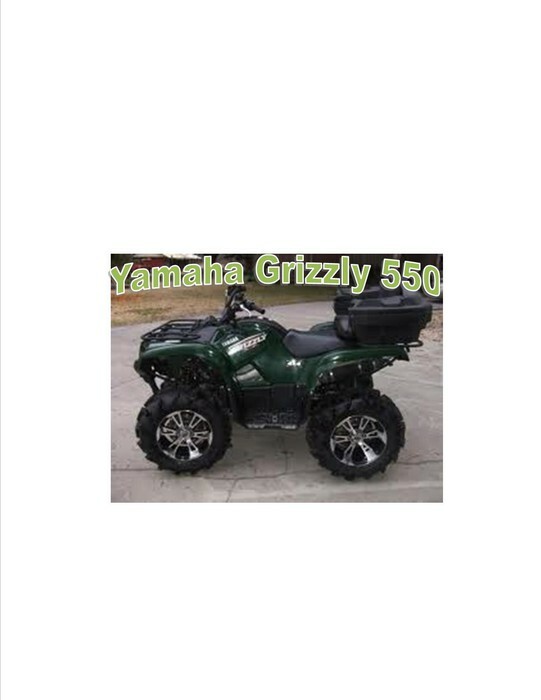 <http://www.warn.com/blog/2011/02/25/a_fearsome_finnish_yamaha_grizzly.shtml>.